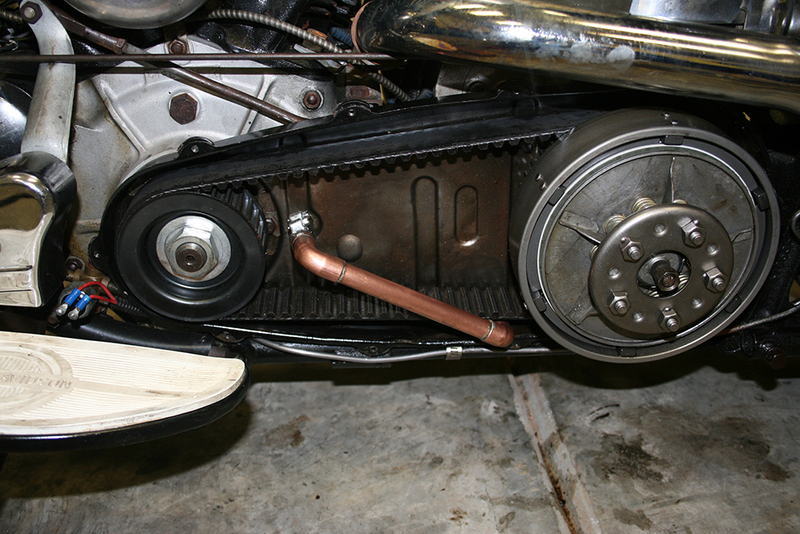 One of the first upgrades I made to my 1964 Harley-Davidson Duo-Glide was to change my primary drive from a chain to a belt. This upgrade provides two major advantages over the stock chain drive, less vibration at higher speeds and less maintenance. My main motivation was less vibration to make highway riding a bit more enjoyable. The less maintenance is also a big plus because adjusting the chain drive is a long process. If you haven’t adjusted a chain drive on a vintage bike, it’s hard to imagine it is a big deal, but on these older bikes there is not a primary chain adjuster like on late model bikes. Instead, you have to adjust the position of the transmission to adjust the primary chain. After you finish adjusting your primary chain, then you have to readjust your clutch and rear chain. On a stock bike, the primary chain is lubricated by engine oil that is sprayed into the primary by an engine breather. To keep excess oil from building up in the primary, there is a drain at the bottom of the primary which allows the oil to drain out and down a tube onto the rear chain, thus lubricating it as well. This is one of the reasons old bikes seem to be constantly leaking oil, but it’s actually not a leak it’s a self oiling chain system. Since you cannot just block off the engine breather, I decided to reroute it around the new belt drive, using a variety of copper plumbing fittings that I picked up at the local hardware store. 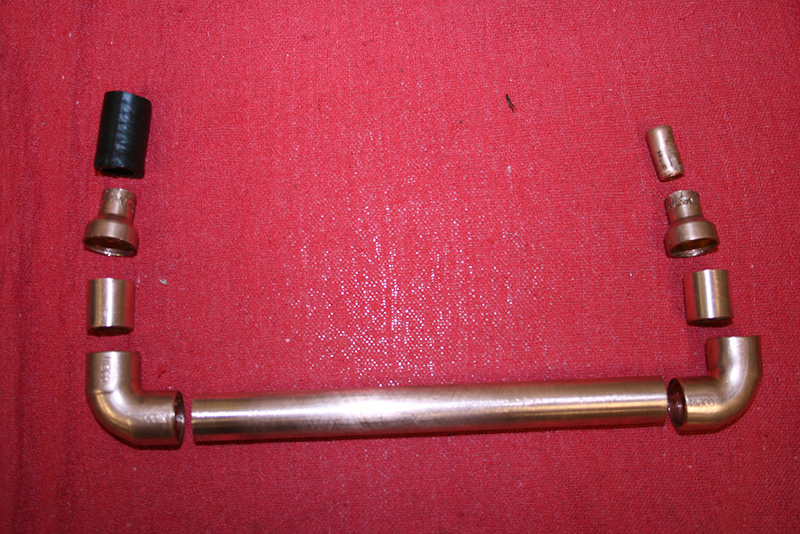 If you know how to solder copper pipe, this is a very easy way to make a breather bypass. If you’ve never soldered copper pipe, then I would suggest checking out some of the “Do It Yourself” type websites before starting this project. Plus standard tools and materials for soldering copper pipe. Now comes the fun part, getting all of this to fit inside your primary cover. It took a lot of trial and error until I got everything to fit just right. Before you start cutting pipe, you’ll want to remove the small elbow on the end of the engine breather, so that you are left with just a straight piece of pipe running into the primary. The first step is to cut about 1/4″ off the large end of each reducer. Without this step, the reducer plus the 90 degree elbow will be too long to fit inside the primary cover. Trim reducers by at least 1/4"
Next I cut two pieces of the 1/2″ ID pipe to fit in between the reducer and the 90 degree elbow. You’ll want the reducer and elbow to fit together flush to elminate as much extra length as possible. Once ready, you can solder the two joints together and set them aside to cool. At this point you can save a little time fitting the main length of pipe, if you can get someone to give you a hand. Basically just hold the two finished reducer/elbows at the correct locations and have your helper measure the distance between them. Once you have a rough measurement, you can start fitting the pipe, trimming as necessary, until the top reducer lines up with the engine breather and the lower reducer lines up with the drain hole. 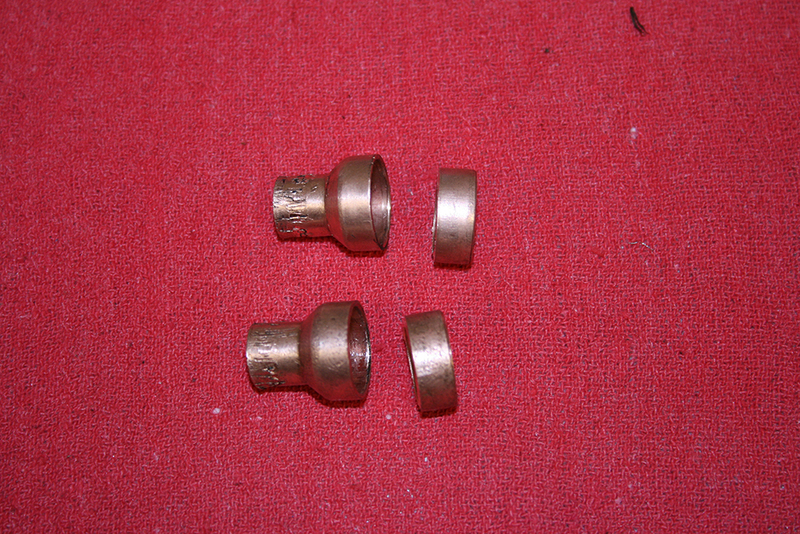 Make sure you do not solder the main pipe to the reducer/elbows until you finish the next step. 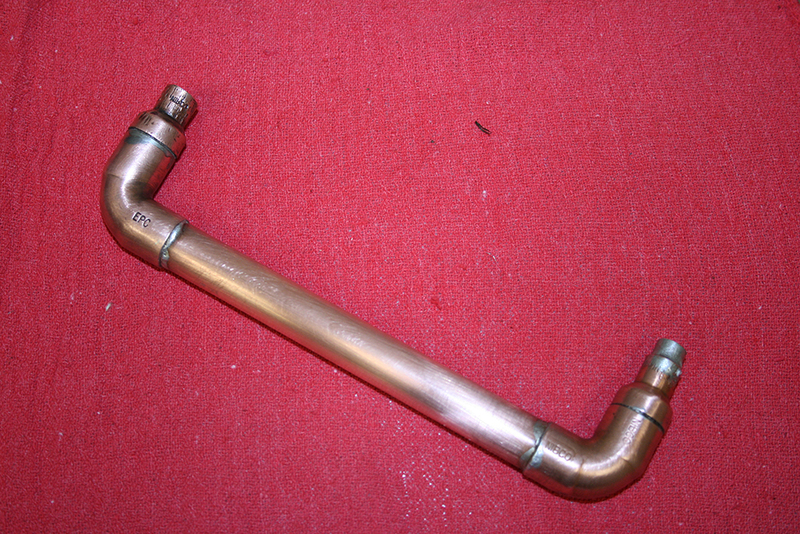 The last piece to fit is a short section of 1/4″ ID pipe. This will fill the gap between the lower reducer and the drain hole. It is essential that this piece fits exactly. If it is too long, the lower elbow will not clear the primary cover. If it is too short, the inside of the lower elbow can contact the belt. With the last two pieces of pipe cut, dry fit everything together and mark the rotation of the elbows on the main pipe. Fit the primary cover back on the bike and make sure that nothing is coming in contact with the belt and that you can screw the cover down. I used a pair of channel lock pliers to slightly crush the lower elbow to gain more clearance between it and the belt. When you are satisfied that everything is going to fit, solder it all together. 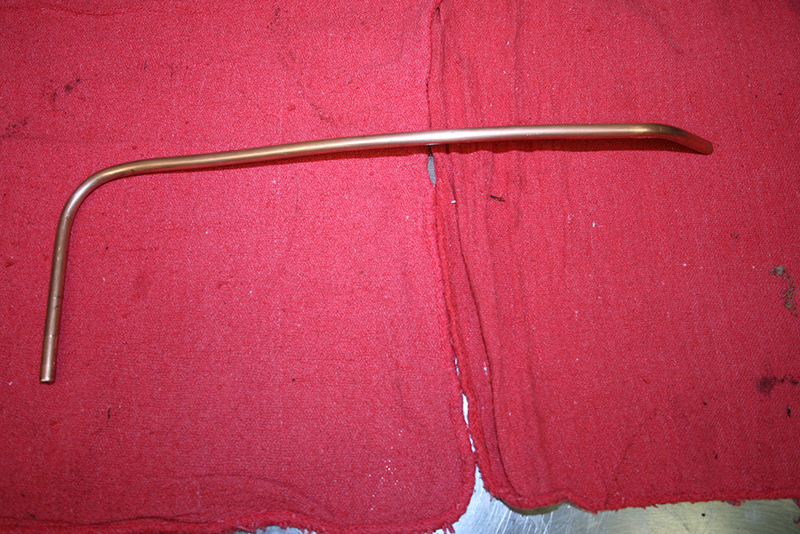 Bending the length of copper tubing which will go from the primary drain to your rear chain is the next step. It took three attempts for me to bend one that I could cleanly route to the rear chain. Keep in mind that the copper tubing will have to be soldered to the lower reducer after it has been installed on the bike. I chose to maximize the distance to the first bend, so that I could have the copper tubing stick a few inches outside of the primary for assembly. Make sure you use something to protect your belt while soldering this last joint. I covered mine with a welding glove and made sure to work as quickly as possible with the torch. The last step is to cut a short piece of rubber hose that you will use to attach the upper reducer to the engine breather. The distance here is critical, so make sure that the reducer butts up against the engine breather when fitting the rubber hose. 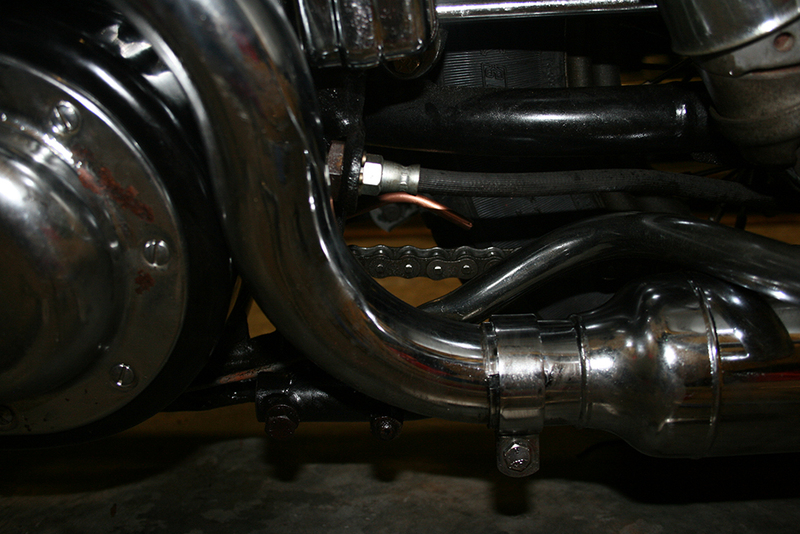 A couple of clamps will hold it all together and then your breather bypass is complete. Why not just attach a piece of rubber hose to the breather before it enters the inner primary? (The breather pipe makes a 90 degree turn before entering the primary, a good place to cut the breather tube off and attach a piece of i/2" rubber tubing)This way you won't interfere with the belt. You can direct the tube to the top of the drive sprocket where it will lube the chain. It will also form a "trap" so when parked any residual oil in the tube won't drip out on the floor.